6th HORSFORTH BEER & CIDER FESTIVAL 2014! The Horsforth Beer and Cider Festival just gets better and better. The 2014 festival, again organised by volunteers from St Margaret’s Church, was attended by almost 1700 people over the two days, the best attendance yet. The festival raised around £14,000 for church funds which helped us to pay for some of the unexpected large repair bills which came in during the year. As usual the “house full” signs went up early on Friday evening, as St Margaret’s Hall reached capacity, and again on Saturday afternoon. Our Twitter followers were able to keep up to date with what was happening inside and in the queue via our feed @hors4thbeerfest. And everyone got in, even if they had to queue for a few minutes until someone else left and made room inside the hall. We continued to admit people well into Saturday evening as there was still a good selection of beer to choose from. 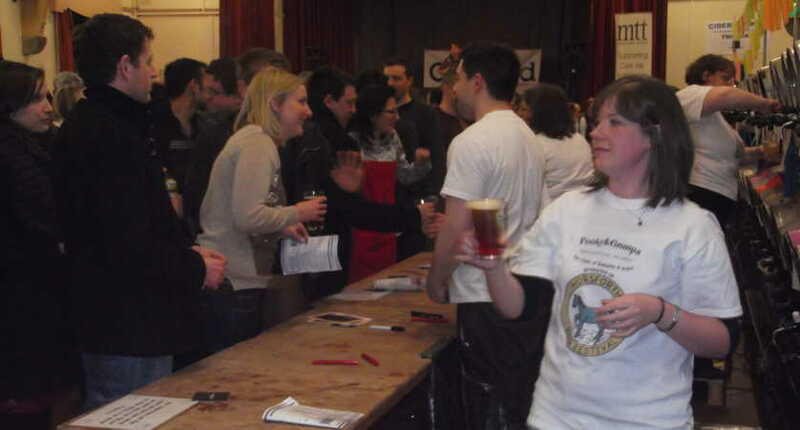 The festival featured 67 different cask beers, in the main bar upstairs. 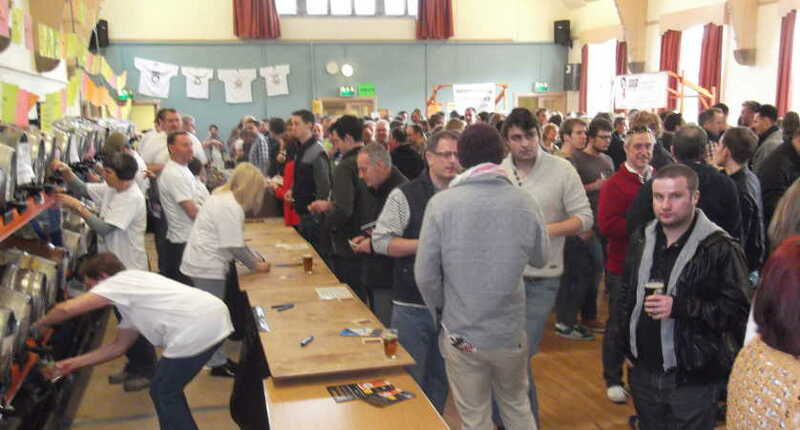 Many of the beers were seasonal, from a mix of local breweries and breweries from across the UK. For those not sure which to choose we even designed three beer trails, showcasing beers brewed along the Tour de France route. We sold over 9,200 glasses of beer (4,600 pints). Hardly anything was left to pour away the next day when we cleared up the hall. Thanks for making our job easier! We featured 20 different ciders, including several ciders new to the festival and the return of some old favourites. Over the two days our drinkers managed to get through over 2,100 glasses of cider (1050) pints. The Cider Bar was very popular, and filled up quickly each day. It was also the place where you could buy wine, for those who don’t like beer or cider, and we sold about 100 glasses of that too. Plenty of food was consumed to soak up the beer. Most of the food was home-made by volunteers from St Margaret’s which meant there was a real variety on the specials board in the café. We also got through mega amounts of hot beef, pork and bacon sandwiches, and 100 portions of pie and peas each day, with the champion pork pies freshly made by Wilson’s each morning. Festival goers voted for the Beer of the Festival, and in 2014 there was a new winner! 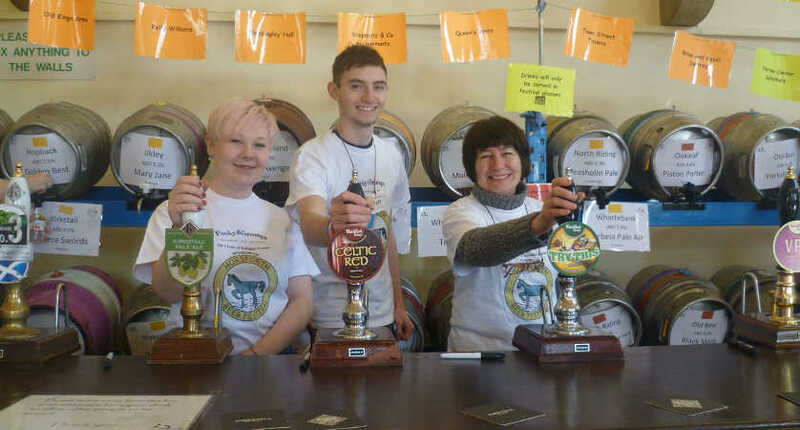 North Riding Brew Pub, our winner for the previous two years, came second and third in 2014 with its Mosaic and Bountiful beers. Thanks to all those who helped in any way to make the festival happen. Classic copper coloured English bitter. Proud to be a sponsor. Drink responsibly. Beer goggles not included. 07961 726 286. IPA, South Pacific hops, smooth & bitter, huge fruit flavours. A very smooth, full-flavoured premium bitter. An excellent balance of malt, fruit & hops comes through in this rich, chestnut-coloured beer. Great Beer; you're here! For Great Insurance, Mortgage & Investment advice call O800 825 0825. Brewed to celebrate the hat making tradition of Luton Malty, copper coloured beer with a hoppy nose. This Beer is brewed using Pearl Pale Malt, Crystal Malt, Wheat Malt, Amber Malt, Fuggle Hops & Golding Hops. Having fun & working for St Margaret's. A blend of English malt & Eastern Europian hops resulting in a pale bitter with a citrus lemon & herbal finish. Cheers! To another very successful year. Pale perfection, fragrant & fruity lovely bitter finish. High quality care & luxury apartments for older people in Leeds. 0113 331 4834. A deep red coloured ale malty, sweet flavour with a dry finish. Available for short breaks. Sleeps 4. Good for walking & fishing. Log fire. Good local pubs. 0113 258 0249. A special brew for the Six Nations rugby tournament. A copper coloured session ale with a full character & plenty of body; slightly fruity yet seriously refreshing - a pleasure to tackle! Fire Safety Design, Production of Fire Strategy Reports, Building Regulations Assistance & Fire Risk Assessments. 07834 977051. A deep red mild produced using pure Canadian maple syrup. Nutty roasted malts come through on the mouth leaving a sweet maple finish, with a light bitterness. Your local professional legal practice, including wills, family, probate, conveyancing & commercial matters. 0113 239 0088. Brewed with a complex mix of malts & oats well balanced, coffee, chocolate full finish. White Cross Rings, Metal Section & Tube Benders, Incorporating "Yorgrip" Aluminium Catwalks & Safety Platforms. 01274 669933. Light copper coloured tasty session Ale. We are happy to quote for all your towbar needs & vehicle servicing. 0113 258 7793. An aroma of pale malt & hops introduces you to a beautifully hoppy bitter beer, despite the predominant hop character, malt is also evident, fresh & clean tasting. Your friendly local Newsagents on Long Row. Newspapers, Magazines, Tobabacco,Confectionary & Off-Licence. Straw coloured with a clean, crisp & refreshing light citrus & honeyed malt flavour & a thirst quenching, hoppy finish & aroma. We make sure buildings stand up, sewers drain & roads go somewhere! 0113 258 3611. Pale gold, floral, big full hop flavours. Country Mun offers luxury custom made dog wear sent directly to your door. Follow us @ CountryMunDogs. 0191 603 0440. A traditional butcher selling only the finest in locally sourced meat. 0113 250 2126. Spring Challenge is a very pale refreshing light colour beer. Proud to give its support to the Horsforth Beer Festival. 0113 258 6486. Rich, complex & dark porter from an original 1872 recipe, with an old port nose. Coffee & bitter chocolate flavours on the palate. Champion Beer of Great Britain 2013. This is a copper coloured traditional strong ale, brewed using six different malts & robust flavours from the combined use of English hop varieties. Best wishes to the Beer Festival from the garden designers at New Leaf Gardens. 07951 455 451. A deep golden beer brewed with Devon malt & a zillion hop flavours from Cluster, Magnum, Bobke, Challenger & Citra hops. Brewed in 2014 to Celebrate the 30th Anniversary of Exe Valley brewery. 1st for quality, value & service in Horsforth for over 25 years! 0113 259 0464. Light amber & hoppy beer with a nice malt balance. Richard & Hilary wish the 2014 Beer Festival a great success! 0113 281 8080. Dark brown coloured beer with a slightly burnt treacle aftertaste. Paul H Metcalfe (Joiners & Contractors) Wish Horsforth Beer & Cider Festival 2014 every success. 07831 570 157. Generously hopped, fruity & citrus. A dry crisp pale ale. Strongly hopped to give a strong but mellow floral finish. Think classic NZ Sauvignon Blanc, reformed as an uncompromisingly refreshing & refined beer. Ruskins is brewed using the finest Maris Otter malted barley, complimented with Magnum & Brewers Gold hops to give a fruity & spicy characteristic with a lasting dry finish. Cheers from Hydrotec. 0113 258 5941. Purveyor of the unique Canadian 'Nanaimo Bar' which goes fantastically with real ales & ciders. 07749 130628. An IPA brewed with 100% Polish hops. A tribute to a fine gentleman. An amber coloured bitter with fresh citrus aromas that develop into a balanced fruity & refreshing dry bitter finish. Bartlett Group is delighted to support the Horsforth Beer & Cider Festival 2014. 0113 258 5711. Using a balanced mixture of pale ale & chocolate malts to give a soft malty taste while Whitbread Golding Variety hops give a light fragrant aroma & clean finish. A popular & refreshing easy-drinking bitter. IT made easy! Town Street, Horsforth. 0113 258 4433. Cascade & Perle hops provide bitterness & delicate aromas, whilst pale malt & roasted barley give a pleasing copper colour to our BITTER, a real ‘session’ beer. Estate Agent. For all your Residential Property Transactions call Dawn Cramp 0113 259 1339. Cravenbrau is brewed using Mittlefruh hops from Germany, commonly found in lager. Light, mild, crisp & very easy drinking! Jordans Solicitors serves both businesses & individuals in a range of specialisms throughout West Yorkshire. 01924 387110. Single hopped american pale ale with lots of citrus fruit flavours. Custom made curtains & blinds. Free measure & design. O113 258 7296. A smooth well balanced porter with hints of chocolate malt flavour, with a rich creamy head & a slightly hoppy nose. For all your building requirements Open to the trade & public. 0113 258 3463. This rich award winning stout has a strong chocolate & roasted coffee flavour with subtle burnt notes. Kelly Williams are pleased to support the Horsforth Beer & Cider Festival. A balanced malty bitter with a refreshing hop aftertaste. SMG Financial Services are pleased to support the Horsforth Beer Festival. Contact Phil Dixon 0113 218 1115. A clean, straw coloured light drinking bitter. This is a fully flavoured beer with floral aromas & a slightly dry finish. Adair Paxton, Property specialists: Mild charge, no bitter taste, stout service & Champagene standards. 0113 258 1150. Brew No3 in our 2014 World Cup of Hops series. Pale in colour with a single hop variety, Summit Hops from the US. Blonde in colour with a fresh fruit hoppy burst & a sweetish aftertaste that is refreshing to the palate. Nearest pub to the Festival. Choice of Cask Ales. Intensely hoppy & resinous pale bitter. Made using four separate additions of English Challenger hops, & then dry-hopped as well! Massive tropical fruits taste, clean finish. Fresh legal services brewed locally. www.pudseylegal.com 0113 290 0380. Need assistance raising finance for your business? We can help. Call us today. 07968 112489. Best wishes for a successful Beer & Cider Festival. A traditional mild brewed using real cherries. An American style pale ale, hopped with Cascade & Centennia hops, infused with a hint of blackberries. Providing domestic services to the highest quality - regular, one-off & ironing. 0113 281 8191. A refreshing Blonde ale infused with the delicate flavour of elderflower. A golden IPA style beer. Refreshing, delicately fruity beer, it carries with it a little bit of sweetness, & just a hint of the promise of summer. Thinking of transforming your driveway or patio? For a free quote contact Horsforth Paving. 0800 389 3588. A mix of six English & German malts provide the colour which is complemented by the popular American hop Cascade. Exceptionaly pale, full hop aromas, clean dry flavour. Airedale Movers - contact us for a competitive quote for your removal or piano relocation. Cheers! 0113 258 2971. Brewed using the finest ingredients. Bourbon, cocoa & oats give this dark beer a rich, full-bodied, chocolatey bitterness. Good luck again for another successful festival. A light golden coloured Ale brewed using English malt. The use of traditional hops give the beer a mellow floral hop aroma followed by a distinctive hoppy taste. Lofhouse Gate are proud to be associated with the Horsforth Beer & Cider Festival. 01942 821111. Lager malts & Hersbrucker hops combine to create the perfect crossover pint for both lager lovers & ale aficionados. Your local haven for ale lovers. Good home cooked food & Belgian Beers. A refreshing crisp ale using a blend of wheat & lager malts flavoured with fresh meadowsweet. Strathaven's effort to quench the thirst of ale drinkers without resorting to lager. Raising our glasses to the Festival…but not our prices. Call in today for experienced, friendly service. 0113 258 0548. Subtle overtones of orange & lemon zest with a hint of mango & gives a refreshing fruity flavour complemented by apple crispness. Theakstons Brewery would like to wish St. Margaret's a successful festival. Exceptionaly smooth and creamy, full bodied stout. Taking the hangover headache out of moving house. 0113 239 0012. A genuine dry stout this beer offers a sweeter alternative, using Roast Barley & Maris Otter Pale Malt giving a rich body & English North down hops to create a bitter edge, the sweetness comes from the addition of Chocolate & Madagascan Vanilla. Best Bitter, distinctly fruity, robust hops, clean finish. A traditional local, with a strong selection of cask ales & homemade food! 0113 258 7339. All American Hopped - Amber/ruby hued ale has a well rounded bitterness with grapefruit, mango & peach hop characteristics imparted by Chinook & Citra. Gabrielle, Robert & the Ibberson & Syme families - 'Good Health To All' & enjoy this brew. A new rambunctious golden IPA brimming with personality with fruity flavours & jaw dropping bitterness - distinctive & unforgettable. Rich ochre in colour, the beer is delicate yet structured with hints of syrup & toasted grain. The earthy richness on the palate brings with it a hoppy, dry finish. Best wishes for the Festival. Satisfying best bitter, huge spicy hop flavours with juicy malts. Well balanced. A deep golden ale, brewed with only English hops & malt, balanced but with a citrus fruit aroma. Real Ales & fine wines. Food served all day from our locally sourced high quality seasonal menu. 0113 258 1608. Easter Special, refreshing premium pale ale. Organ builders, tuning, maintenance & restoration. 01535 642891. Treating the local community for generations. For all your routine family & cosmetic needs. 0113 258 3349. A warm dark mahogany coloured beer - Silky smooth with a fruity/spicy mouthfeel. www.towerwood.co.uk The finest pet care on tap! 0113 267 8419. An easy drinking straw coloured beer. Maris Otter & Willamette hops give the beer a crisp bitterness with a hint of citrus aroma. Horsforth's only retail Locksmiths & Alarm Installers. 0113 258 1538. Great Cider; you're here! For Great Insurance, Mortgage & Investment advice call O800 825 0825. The Horsforth Festival 2014 'Cider Bar' Sponsor. We specialise in the submission and management of Planning Applications and Appeals. 07970 711548. 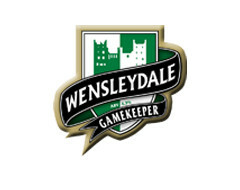 Delecatessen - for a taste of Yorkshire & more! Plumbing & Building serivice. Specialists in Kitchens & Bathrooms. 07946 463682. The Magazine that delivers! To advertise call 0113 274 5639. 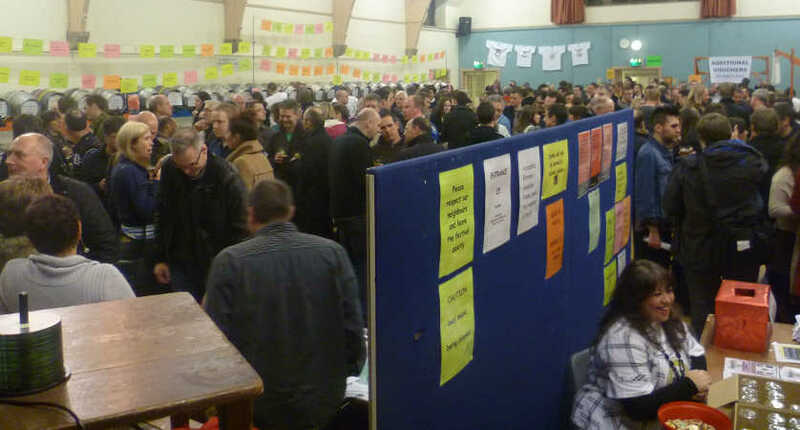 Wish the 6th Horsforth Beer & Cider Festival every success! Providing a nurturing workplace for those with learning disabilities to develop new skills. Town Street, Horsforth. Award winning Estate Agents! Our team of Property Professionals are ready to help you move! 0113 258 2657. To hire any of the rooms in this venue please conatct: 07530 892156.